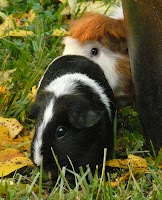 Here are my piggies! It's been cool enough out, recently, to give the girls a bit of outside time, and they're definitely enjoying it. They run around, chut at each other, nibble on the grass and the clover, and generally have a good time. Bali, the most photogenic pig ever, is my rock star. She weighs 6 lbs and has the 'do. She's the red and white one, if you can't tell. Someone found her running around behind an apartment complex and took her in to find her a home. She's a terrific pig with an awesome personality. She's very lazy, but she's also very outgoing and very happy to tell you what she needs. Karma, the skunky looking one, is a new addition. My vet got her after someone's children spray painted her, and we ended up adopting her. It took about a month for her coat to return to normal, but she's a healthy, happy piggie now. She's much more reserved than Bali and a bit high strung, which really isn't surprising considering that she's had a rough time of things. She's lean, slick, and has the shiniest coat I've ever seen. She's kind of silly, but she's still so skittish that I don't think we've seen the real Karma yet. 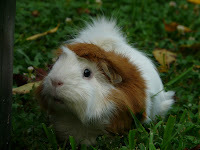 I must admit, this is the first time I have seen a guinea pig in a garden picture and I love it! They really love being outside. I wish it weren't so hot during the summer or they'd be out there all of the time!